Despite the growth of the medical marijuana industry, cannabis remains an illegal substance on the federal level. As a result, banks refuse to work with these businesses, leaving many marijuana merchants with little to no options. The majority are forced to operate in cash-only and fear being robbed daily. A new strategy by Orlando-based financial institution First Green Bank has turned a lot of heads. 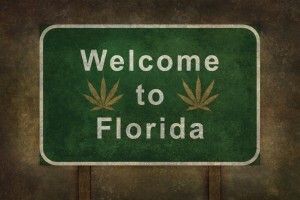 In fact, the institution has been actively seeking Florida’s marijuana businesses. Considering that marijuana is classified as a Schedule 1 substance by the DEA (no currently accepted medical use and a high potential for abuse), how is this possible? In a recent interview, Ken LaRoe, founder and chairman of First Green Bank, revealed the institution’s straightforward strategy, “We don’t touch the cash”, he said simply. While First Green Bank does technically handle the cash, it sticks to a strict hands-off approach. With the federal regulations that make the industry cash based, First Green works closely with an armored car company that transports the cash directly from dispensaries to the nearest Federal Reserve location. This institutions willingness to venture into the industry has made it the exception (definitely not the rule). A widely cited memo from a deputy attorney general in 2014 created a huge obstacle for banks operating in states where cannabis is legalized. According to the memo, if money from organized crime makes it into marijuana business’ bank accounts, the banker(s) could face criminal prosecution. First Green Bank is one of the few bold enough to accept deposits from cannabis merchants. Thus far, First Green Bank has collected around $30 million in deposits from marijuana business. According to the FDIC, the bank had $485 million in deposits (as of March 31). However, the institution has not moved to extend loans to marijuana businesses. LaRoe explained that offering loans to these companies involves many risks, including: the property is subject to seizure and contracts can be legally unenforceable. For now, marijuana merchants in need of business funding can find fast cash solutions with alternative lenders like Marijuana Merchant Account (MMA). Specializing in this industry, MMA can provide funds in as little as 24 hours; the “high risk” nature the industry is not a problem. MMA also offers secure and efficient marijuana processing solutions. What are LaRoe’s thoughts for the future? Although First Green Bank currently has a monopoly on the Florida medical marijuana industry, he is optimistic that other financial institutions will join in. It would also make him feel more comfortable having others at his side supporting the industry. “I’d like to see other banks getting into it, just because there’s strength in numbers,” he says. This entry was posted in Florida Marijuana, Marijuana Banking, Marijuana Industry and tagged banks refuse to work with Marijuana, Banks Risks Scrutiny, dispensaries, Florida Banks, Marijuana Banking, Marijuana credit card processing, marijuana merchant account, Marijuana Merchants Services, Marijuana Processing, Medical Marijuana Merchant Account, merchant account to sell marijuana, merchants and medical by admin. Bookmark the permalink.